Setting sail from the Southern Port of Vlychada at 15:30 and following the coastline we reach the Red Beach in Akrotiri, one of the most beautiful beaches of the island with a distinct red coloration caused by the rich minerals and iron soil and that’s where the first swim stop will take place. Towels and snorkeling gear are provided on board, on a complimentary basis. Then we head to the White Beach, where you can gain access only by boat. A stop for a swim and snorkeling is highly recommended since it is difficult to resist the crystal clear blue waters with the rich underwater environment and reefs. As you enjoy yourself, the attentive crew will prepare a delicious dinner on board consisting of a meat and seafood variety on the barbecue, Greek salads and appetizers, accompanied with local wine, beers and soft beverages. Leaving the White Beach and heading to the Venetian lighthouse, we sail below the Indian Rocks through caves and rock formations, characteristic to the Aegean landscape. 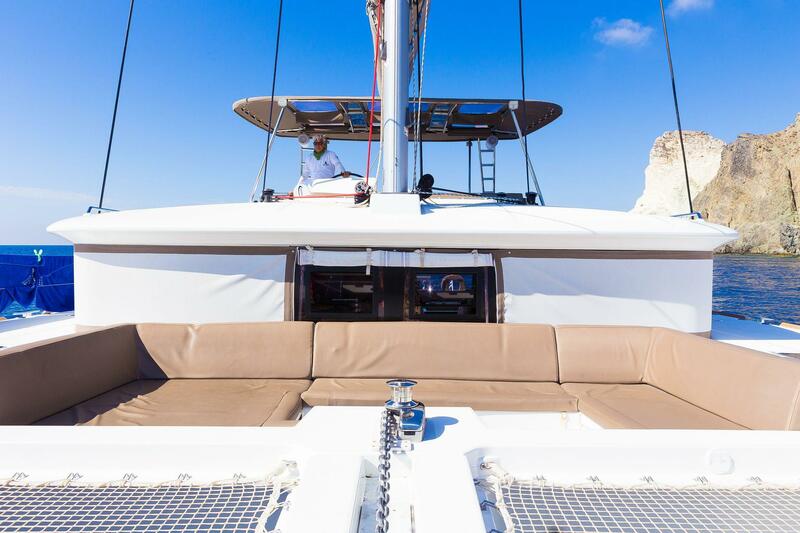 After sailing below the lighthouse the sailing yacht will turn and enter the Caldera of Santorini. There you will see everything opening in front of your eyes. The picturesque white houses hanging from the cliffs like grapes, the cliff formations and the volcanic islands of Palea and Nea Kammeni. There you will have the chance to sail below the traditional villages of Fira and Imerovigli and the overwhelming rock formations consisting of basalt and pumice. From there you will head to the crater of the volcano, you will sail around it to have a full view of it and stop at the thermal springs for a swim in the sulphurous waters, that offer a natural spa. After swimming at the hot springs the catamaran will sail below Oia to the open sea for you to enjoy a magnificent sunset with a cool complimentary cocktail in your hand, offered by our crew. Our experience will be concluded in Ammoudi Bay, right below Oia.